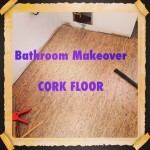 Bathroom remodels are big these days, from DIY weekend projects to HGTV-worthy renovations. But if you’re planning on doing any work on your bathroom, it can be difficult to know where to start. Even just trying to choose the right bathroom vanity can be a little overwhelming. Bathroom vanity combos – vanities that come with a matching counter and sometimes sink and faucet – are a great way to take some of the stress out of the decision. But there are a few things you should consider before you settle on this option. 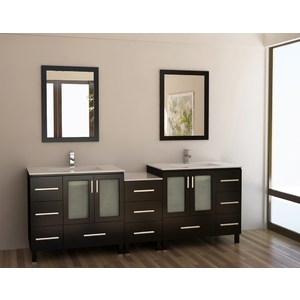 One of the most important advantages of bathroom vanity combos is that buying a “complete” bathroom vanity is often much less expensive than trying to buy all the parts on your own individually. 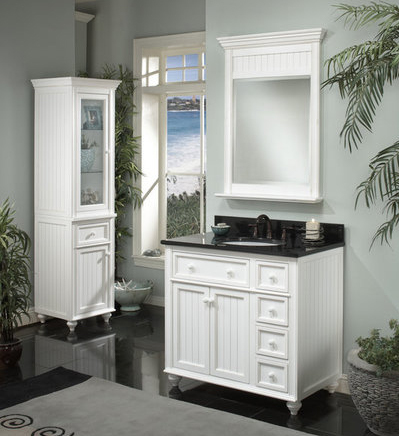 Many people don’t know that typical bathroom vanities come without vanity tops. This means you’ll need to find, cut, and install your own. Manufacturers of bathroom vanity combos get special discounts for buying stone in bulk, and pre-drill and cut vanity tops to match their vanities. This often means a huge savings and convenience that’s passed on to you. The big drawback of bathroom vanity combos is the exact flip side of this: sure, you get all the parts all at once and for a lower price, but because those savings come from the manufacturer buying in bulk, you’re also pretty limited in your options. If you go for fully custom bathroom cabinetry, you can pick exactly the piece of granite or marble you want to go on top. 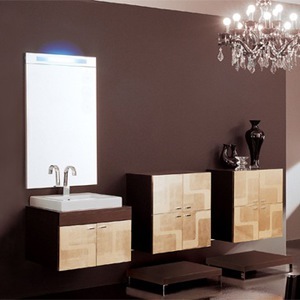 But bathroom vanity combos are usually limited to maybe four color options, and if the sink and faucet are included, there are hardly ever more than two style choices. That said, if you don’t feel like the world’s most savvy designer, a limited set of style options might not be a bad thing. Those four or so granite or marble options are picked and paired with vanities by professional designers. That means that even if you lack a lot of bathroom furniture know-how, bathroom vanity combos offer an easy way to get a sleek, aesthetically pleasing bathroom vanity without the stress of trying to find, coordinate, and combine all the pieces on your own. If you have a decent amount of do-it-yourself ability and are looking to do a significant portion of your bathroom remodeling on your own, a bathroom vanity combo is a good option. They come with all the pieces you need pre-fit and pre-drilled. They often require relatively little know-how to assemble, especially ones that come packaged with sinks and faucets. This is a very, very good way to save on contracting fees without making any major sacrifices. If you have a contractor installing your new vanity top and they drop it, break it, crack it, or in some other way injure your new favorite piece of granite, it’s on them. It’s why you want a licensed, insured, bonded contractor – if something goes wrong, they have to deal with it (and, more importantly, make it right!). With bathroom vanity combos, the manufacturer is responsible for any damage during shipping or defective products (though please!! for your own sake look up return policies – including restocking fees! – before you commit). If you’re DIYing and you drop your included granite counter top down a flight of stairs – well, that’s on you. 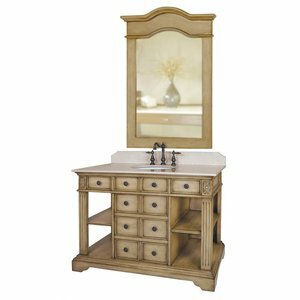 Last but not least, bathroom vanity combos are wonderful because they are available in almost every size and style, and if you find them online, they’re often steeply discounted. You want to be sure you know all your measurements specifically (yes, that probably means looking at schematics) before you buy this way. But buying online can get you lower than showroom prices, and oftentimes free shipping. That means all the parts you need to build your new bathroom vanity are delivered right to your door. If you’re trying to get out of some of the stressful, time consuming decision making and legwork of doing your bathroom remodel, I can’t think of a better way. Bathroom vanity combos aren’t without their drawbacks. But if you’re looking for a way to save a lot of time and money, and aren’t too picky about hand-selecting each component of your bathroom, they’re a great first step to building a new bathroom, headache-free. HomeThangs.com (http://www.homethangs.com) is more than just a Home Improvement Superstore. They’re constantly seeking to provide homeowners and designers with the right products at competitive prices. With a wide selection of products, expert design tips, and comprehensive shopping guides (http://www.homethangs.com/blog/), Homethangs is a company that’s there at all stages of the design process, from idea to execution. It’s their goal is to make dream remodels doable. Another money saving tip is to buy a kitchen cabinet sink base for use as a vanity. They are far less expensive. Vanity cabinets go for a premium. You can can add kitchen cabinet drawer bases on one or both sides too. You just have to make sure that the height and depth of the kitchen cabinets will work for you. They are taller than a standard vanity, but actually this works better for most adults. They are deeper too which provides more counter space… if you have room for it. super tip Brian… you know when I saw you pop in I thought you were going suggest converting a piece of furniture or table. I know you have done… and I have myself done a handful of times. thanks for popping over.